Even if your kids try to stay away from drama at school, it doesn’t guarantee that bullies or mean girls will not target them with gossip and rumors. Unfortunately, when it comes to rumors and gossip, all teens are at risk, especially if the people spreading the rumors struggle with envy or are seeking revenge. What's more, the targets of gossip can change at a moment’s notice. One day kids are talking about who did what with whom and then the next moment, it is your child that is being targeted. As a result, you need to be prepared on how to handle these situations. Addressing the situation right away and coping in healthy ways can prevent a lot of heartache in the end. So, how should your child deal with rumors and gossip in a way that won’t make the situation worse? While every incident is different, here are few ideas on how you can help your child cope with gossip and rumors. Figuring out who started the rumor may shed some light on why it is happening. Was the rumor meant to hurt your child or is it just a case of misinformation? Is the person gossiping or spreading rumors intent on ostracizing your child and getting others to turn against her? This information is important to know before your child responds to the rumor. For instance, it is easier to clear up a case of misinformation than it is to respond to relational aggression. Gathering a little background information will let you know what steps to take next. While this is often easier said than done, it is important that your child not dwell on the things being said about her. Ruminating about gossip and rumors will only make your child feel worse. Instead, try to help your child focus on other things. Get her involved in outside activities or plan a mini trip – select something that will take her mind off the gossip. It also is a good idea to avoid social media for a while, especially if this is where the rumors are being spread. While this is a hard thing for teens to do, and they may even say they want to know what others are saying, it is sometimes better not to read every cruel word someone types. Remember, not all kids are able to just roll with it and wait for the gossip to die down. Even petty rumors, gossip, and name-calling can take a serious emotional toll on your child. Be sure to watch for signs of depression, anxiety, stress-related conditions and thoughts of suicide. Even warning signs of more serious conditions like eating disorders, self-harm and post-traumatic stress disorder should not be ignored. Get your child in touch with a counselor who can help her deal with her negative emotions. And be sure to provide a supportive home environment by listening, being encouraging and being empathetic. Even if your child appears fine at home, it is always a good idea to provide an outlet for her to share her emotions. Sometimes the best person to vent to is someone who has no emotional stake in the situation. When people are mean, it is hard not to feel overwhelmed and react in negative ways. But just like with other types of bullying, it makes it worse when kids reward a bully’s efforts by getting visibly upset. It is also tempting for kids to respond in kind with rumors or gossip of their own. Encourage your child not to seek revenge but to take the high road instead. Some kids have even found that it helps to turn the situation around and do something positive in the face of the meanness they are experiencing. When kids are using the Internet to spread rumors and to gossip, be sure you keep copies of the interactions. Report the information to your child’s school. Many states now have laws in place that allow schools to address the misuse of social media. 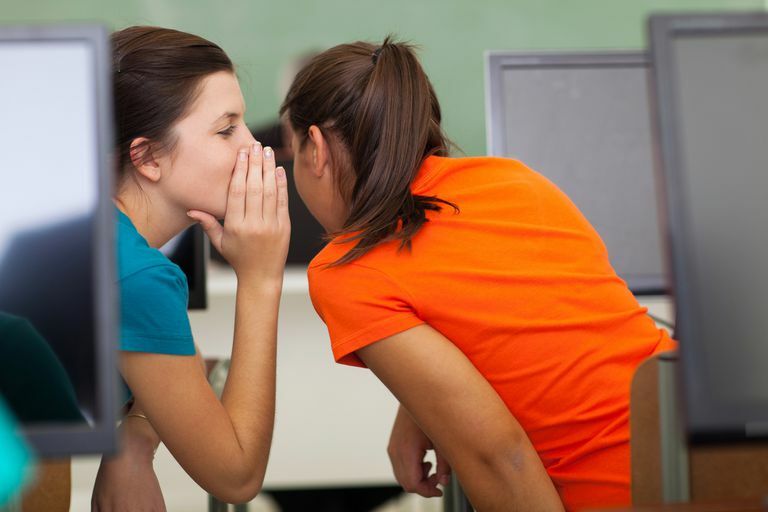 Additionally, gossip and rumors are not limited to social sites outside of school hours. They filter into the hallways of the school too. As a result, you need to be prepared to deal with gossip and rumors just as you would deal with cyberbullying. Encourage your children to think about what they have learned from this experience with rumors and gossip. Also, stress that they need to be mindful of what they tell others including what they put online, in text messages and in emails. All this information can potentially be used to create rumors about them. Explain that the more private information they make public, the more ammunition others will have. So they should be very careful about whom they confide in. Of course, the best way for your teens to prevent being the talk of the school is to take steps to manage their online reputations. They should be very diligent about filtering and monitoring what they are putting online. And if they ever do experience rumors and gossip at school, make sure they are not only responding in healthy ways but also taking care of themselves mentally and physically.